The Roster sidebar gives you the option to view and create rosters quickly and intuitively. With a wide variety of roster views and options for filtering you have the flexibility to quickly create detailed rosters for your business. Day view shows you shifts for one day at a time. This is useful if you want to make sure you have staff coverage throughout the day. 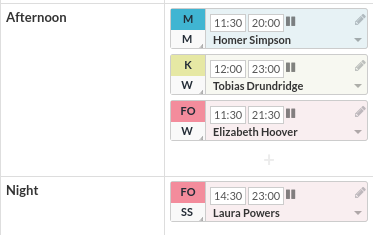 You can switch between days by clicking on the relevant day at the top of the shifts. Tanda sets up the Morning, Afternoon, Night and Double Shifts by default. To delete them, just click Delete at the end of the row or to change the new just click on the Name field and you can edit it. Set your groups by specifying the times that you want to group in the columns. This works best if you have at least a Starting Before time for each group. When you've finished go back to Rosters > Current Roster and Shift view should automatically open back up and you should see your staff split into the relevant groups. Can be used for checking your total wage cost, breakdown per day and by employee once you have built your roster, to check for any areas you could be more efficient. You can find more information in the Costing a Roster article on this. The section below views is the locations & teams filters. 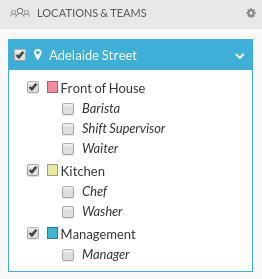 Each location set up in your account, and the teams within, will be listed as a separate set of filters. You can filter by any combination of teams and locations by ticking the checkbox next to their names. Tanda will save your filter preferences so that when you look at the roster again later, your filters are still selected. If you have multiple locations in your business, click the settings cog next to the locations and teams title to collapse or expand them all at once. You can also click the arrows on each location box to collapse them manually. If you want to clear all filters and show your entire roster click Show all shifts. 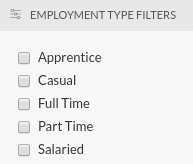 As long as your staff are tagged appropriately within their individual profile (on the payroll tab) you can use the employment filters to roster according to employment type. Tick the filter and when rostering you will only be able to roster staff that match that filter - for example you can roster only casual staff.